DINING ROOM: Finally – (LONG!) Curtains! I wanted to call this entry “Curtains At Last” but I’m going to end up with so many “At Last!! !” posts in this blog, so I figured I’d paraphrase. Anyway, it always seems like an eternity before I finally get this or that for the house, because I quit working for a big law firm, people! And drastically cut our income in half. Sure I have more time for the kids which I love – but it also means I have to save save save and budget better before I can buy things like new curtains!!! Not only were they too short, but they weren’t wide enough too. Well, of course they were all wrong – I didn’t measure my windows! Such a rookie mistake. Both panels only cost around Php 1,000 total but of course I didn’t run out to get new ones or add fabric to lengthen them like I saw in Pinterest. Some other task or item for the house just needed to be tackled first. So I actually lived with those ridiculous curtains for a couple of months. Since I had to prioritize expenses (mostly on the kids’ rooms), I at least did my research: measured the curtains (what was I thinking) and I decided I wanted to get my curtains from Arq Living in Magnolia. I found lovely pure white sheer curtains and they were LONG. After three trips to Arq Living, it was finally time to buy my two panels. (And I did, on my 3rd visit to the store. And I measured the curtains for the 3rd time too, just to be sure). The one on the left is linen but it’s an off white, almost dirty white color in person. I got the one on the right, which is made of chiffon and in the crisp pure white I wanted (though not so obvious in my crappy phone photos). Both curtains cost the same. And both are 96″ long – longer than what I needed, but after my silly short curtains, I figured I’d welcome the puddling. They’re more sheer than my previous curtains (that it was thick and white but sheer was what I likedl about those short curtains), but these are wide and long. Hurray! Now I don’t get annoyed every time I sit down to eat and see my cropped curtains. I’m still trying to decide if I’ll get them hemmed so the curtains are “kissing” the floor or I’ll leave them puddled. For now, I am just so happy the new (and longer) curtains are finally here. I’m only allowing myself 2 sets of white curtains, and for the other set I think I want linen. I found some linen ones in H&M Home but they don’t have curtain rings, which I really prefer because it makes pulling the curtains back much easier. I will probably have the other set customized this time. (My former boss gave me the number for the woman who does her curtains; they’ll come to your home to measure the window but I’d have to source my own fabric. I also checked Larry’s Curtains for customized curtains also; it’s more expensive there but they have available fabrics so it’s convenient. I forgot to ask though if Larry’s will come to your house to measure, or if you have to bring your window measurements to them – I didn’t think all this was possible, having someone over to measure, until Grace told me!). I never realized until now how expensive it is to change your window treatments! Not just curtains but the rods as well. Curtains are my waterloo for the living room as well. Now it’s time to save up for the living room windows – 2 rods and 6 curtain panels. I know I’ve been through way too many reiterations of my checklists and to-do lists for the house. I tried to justify it to myself as the list adjusting to the needs of the room (or corner), or their specific issues which emerge only after I made the list (and the revised list and the further revised list etc.). But truth is, since I kept tweaking or revising my checklists, it feels like it’s been a never ending journey to finish the house. I don’t have the fulfillment of finally checking off each item because the darn lists keep changing. In line with my monthly inventory of hauls for the house, I’ve decided that staying focused on the home improvement/renovations should start with finally coming up with a list and sticking to THAT list. And enough day dreaming about the frills. Even though the house looks pretty bare in photos, I actually have stashes of decorative items all waiting to be displayed or pulled out or hung. Enough – for now! I’m stripping down all the extras and sticking to the bare essentials to make each room livable, and at least lovely enough for our daily use (sans knick knacks!). I’ve been coming up with my Bare Essentials Lists for each project, with a little link to all the past list versions I’ve made for each room or corner in the house (to revisit in the future). Actually, when I recently reviewed all the lists I made I discovered that, for the living room alone, I made FIVE different to-do lists in a span of 6 months! That means I kept changing everything that I needed to do or accomplish almost every month. Sheesh. It’s no wonder the house isn’t finished. I promised myself, from here on in, I SHALL STICK TO THE PROGRAM. No changing, no revisions, no nothing until I get this house in order. Finally, we have an area rug, people!!! I seriously thought it would take me at least a year before I’d be able to purchase an area rug for the living room. I didn’t want to settle for any old rug – I wanted it to be something I really love. I had set my mind on a handcrafted abaca rug from Weave Manila and, like I mentioned before, they promptly gave me a quote. I asked for quotes for smaller rugs though because I knew rug prices are pretty nuts, and I figured I’d only be able to afford a small one. I even asked for pricing for just 4×6 and 5×8 rugs from Weave Manila! After reading Emily Henderson’s guide on rug sizes (basically, “go big or go home” – she has an article on making the mistake of getting rugs that are too small for your space, and another article on how to pick the right size rug), I learned that even that 5×8 rug would have been puny. How clueless I was! But I was scared that going big meant spending way, way more. I was right, too, because the rugs I ended up checking out truly were expensive, the more square feet you go for! Apparently, area rugs are one of those major pieces you have to invest in for your home. I liked that boho rug I spotted in Triboa Bay, but I didn’t ask how big it was because at the time I saw it, I knew I couldn’t afford it. But it made me realize that I’ve been liking prints on my rug – nothing too busy or colorful, but some print definitely for texture. So you can imagine my joy when I: 1) discovered the West Elm outlet store in Paseo de Sta. Rosa in Sta. Rosa, Laguna; 2) discovered and fell hard for their “Souk” rug; and 3) found out said rugs were on sale! The H and I went back a week after discovering the outlet store, and we bought a 5×7 Souk rug. Clearly, I didn’t want to listen to Emily Henderson at the time (she did say small living rooms can get away with smaller rugs). I was so, so tempted to get that pink print Morrocan-esque rug from West Elm, but I knew I’ll end up regretting it. It’s like those printed b&w plates I got – I was so enamored when I first got them, but a month after, I wish I had gotten classic white plates first. So my rule now is to always get the white or neutral-colored piece first. (I know this is a very basic rule, but I have made the mistake way too many times of picking out the funky, colorful piece first before my neutrals). Anyhoo, here is a photo of that Ashik rug from West Elm, in this blogger’s lovely living room. The Ashik rug in the West Elm outlet store only comes in 5×7 though; in that blogger’s post I think she has at least an 8×10. You can see how small the rug is, relative to the engot sprawled across. Some people might think the rug looks fine. But I thought it looked narrow, especially coming from the front door and considering I don’t have seating across the loveseat to sort of anchor everything in. I took tons of photos and realized since the rug was small, having my furniture sitting on it made the living room look even smaller. I was also thinking long-term: should we move someday (and most likely to a place with a bigger living room! ), then the only place I’d be able to put a 5×7 rug like this would be beside a bed. So we decided, screw it. Let’s go big. I rang up the people in West Elm Sta. Rosa and reserved the 8×10 Souk rug we saw there. We rolled up the little rug, put it aside, and a week after, we went back to Sta. Rosa and got the bigger one. (Yes, this rug business was 3 weeks in the making). This is the Kasbah, another wool rug, but without tassels like the Souk and Ashik. I really liked the print on this one too, a bit busier than the Souk. In the end though, I ended up with the rug I liked first, and right from the start – the Souk. That’s Vince, our very awesome sales rep from the Sta. Rosa West Elm/Pottery Barn outlets. Excuse the mess under the stairs! We only have one help right now and I’m losing the battle against clutter. We measured our living room and knew this 8×10 rug would be too big since there’s a spiral staircase in the middle of the open floor layout we have here at home. We knew we’d have to either fold it or hem it or even cut it. Naturally, since the point was to go big so we can bring the rug with us if we move, we opted to fold the rug. I need to move the rug so there’s space between the rug and the far wall, but honestly, I think the whole set up finally makes our living area look bigger. The rug also solved my problems with that wall – it no longer looks so oddly bare as compared to the opposite corner, and now I don’t feel compelled to fill up that spot behind the front door. Best of all, the whole family really enjoys the Souk. I read online how the rug sheds, but I don’t mind – I have 3 boys, and there are plenty more messes at home to worry about. It’s fluffy, and it’s soft, and I love how it toned down the redness of our terra cotta floor, grounded the furniture, and added just enough oomph to the living room. The boys have been spending a LOT more time in our living room (they usually hang out in the lanai), and I’ve spotted both my eldest and my youngest taking naps there. Since the family has been spending more time in the living room since the rug arrived, I’ve had to tweak my living room checklist a bit – for instance, floor pillows are now in order, as the boys have been hanging out sprawled in the living room. Bo has been taking his morning naps on the new rug – sans playmat and all my gosh. (In case you can’t tell, I’m not too fussy about the kids getting dirty). I have seen this rug all over design blogs and in Pinterest, and I am honestly so chuffed about having one at home. I so love it, and I never in a million years thought I’d be able to get an area rug for the living room this year! (Thank you to my H!). The living room is far from perfect, but I feel we are closing in. (I’m honestly having second thoughts about my love seat. I think I should have gone fore a streamlined 3-seater or even a sectional; and because the “couch” is small, the coffee table now feels small too). I’m looking forward actually to moving on from this corner because I’ve been rearing to focus full-time on the kids’ rooms. I’m positive new (and clean!) curtains will make a big difference in the living room – I promise, that’s next on my list. Oh, and we got a home diffuser, finally oh finally! It’s not the prettiest thing but the one with the bamboo top isn’t bad, and we’ve always wanted to have a diffuser at home. The H was the one who got it too – we found them for Php 500 in Dapitan! The stall there claims it used to supply the same diffusers to Mia Maison – they sell them for around Php 2,000 there, so yay, nakatipid! (As for the baby bottles on the table they’re there because #LIFE). My complete and last updated to-do list for the living room here. I’m still a bit ashamed of my December list (as I felt my purchases were all over the place), so I think I was more careful (maybe more intentional?) with the things I got for the house for January. SM Department Store bed sheet set (1), extra pillow cases (4), and pillow protectors (4) for our yaya, and Heim pillow shams (3) – I’m preparing for the bunk bed!! The carseat we bought, by the way, is pre-loved. Saved us a bundle; I have yet to clean it though. And Bo finally has his own stroller – he’s been using Laz’s baby stroller and since Bo is the THIRD kid to use it, you bet that old stroller is battered! Now my Bunso finally has his own new little buggy (thank you, Dada!). I have stand fans in most of my room checklists for “things to get.” Electric fans are just a reality in this country. Plus, we have a garden and it just makes better sense to open the windows especially downstairs. I don’t see the need for air-conditioning in the living room. (Though oddly enough, the lanai was air-conditioned because it used to double as the family room). I think for the downstairs we’ll eventually get A/C for the shared boys’ room and the lanai. But even with air-conditioning we’d still need to get fans. Para tipid kahit papaano sa kuryente. I’ve looked up sleeker fans and read the reviews. Those Dyson bladeless fans are pretty all right but so expensive. I also discovered Vornado fans and some in-depth reviews I’ve found say it’s better than the Dyson, air circulation wise. It’s cheaper too and locally available. I like how it looks kind of retro. But I worry that the stand fan/pedestal version may look a tad too chunky for our tiny living room. And it’s got a big foot print (I was going to put it near the wall in our no-entryway entry so it faces the couch). They have this Vornado fan in white and grey. 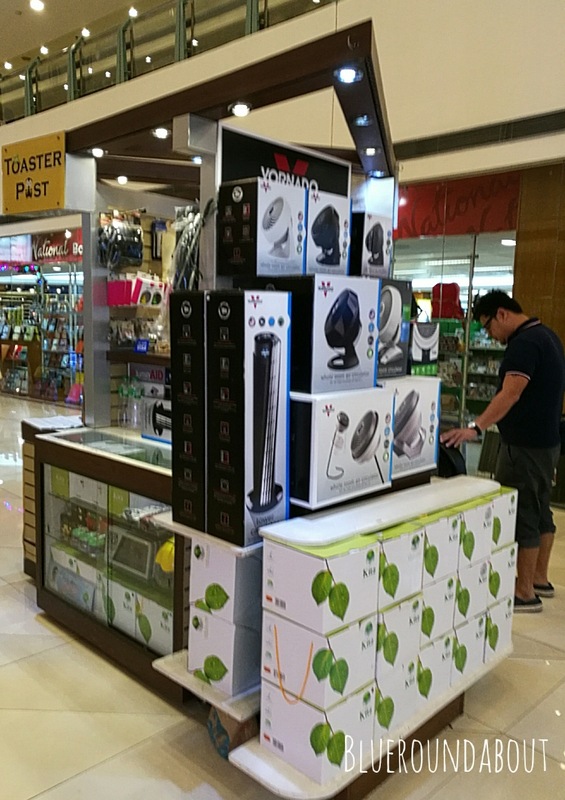 There’s a Vornado stall in Trinoma, off to the side of National Book Store. 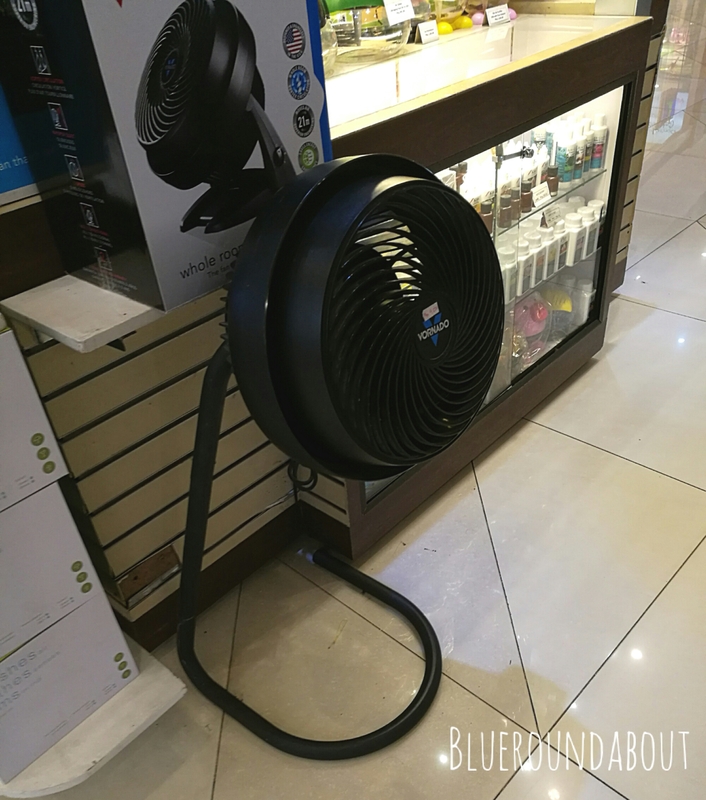 I found Vornado fans in Rustan’s Department Store too. (You can see the white version of the stand fan on one of the boxes in the photo). I’ve already decided to get a ceiling fan for the shared boys’ room, and was on the hunt for a stand fan for the living room. Then I realized, why not get a ceiling fan for the living area as well? The ones I found by Hunter have light too, and I plan to add light in the living room so why not just get a ceiling fan with light? 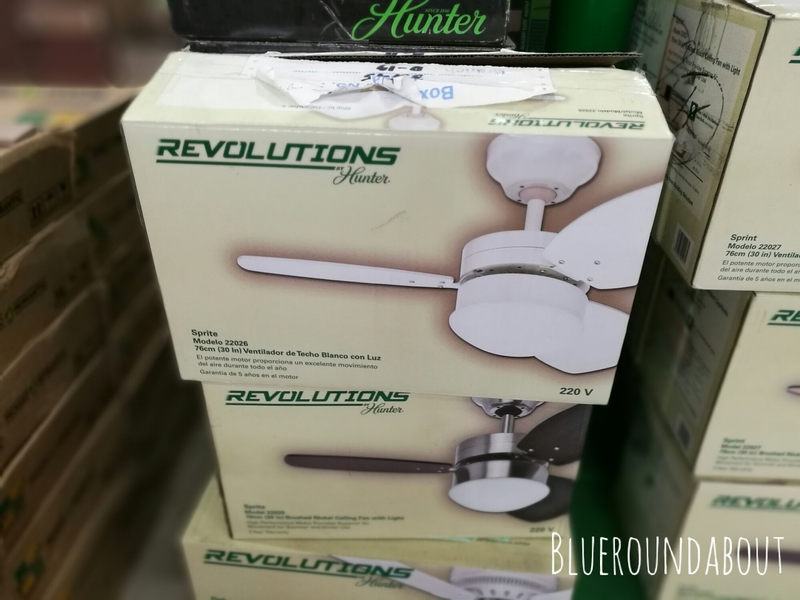 I only decided to go for ceiling fans when I found simple, modern designs from Hunter. (I recall ceiling fans used to be too, um, embellished – or they look like factory fans). The white one I was eyeing for the boys’ room would work nicely for the living room too, me thinks. This saves me from getting a pendant light and a separate fan for the living room. This also means I can move the 2-barrel white Asahi we’ve been using for the living room to the dining area, where I can put it under the stairs so it’s out of the way. (That’s one less thing to buy! ).